Settlers attacked the villagers of Iraq Burin on Sunday, the 6th of March. The farmers had recieved permission from the D.C.O. to farm their land for two days, and were accompanied by the Israeli military to protect them from violent settlers. Soldiers left the area and about 20 settlers came down and attacked the farmers, throwing stones and beating them with sticks. People from the village came to protect the farmers and managed to force the settlers back to the settlement. 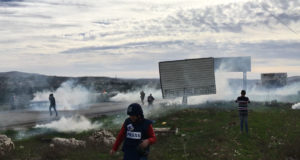 The Israeli Military then returned and fired tear gas at the villagers. Fortunatly, no one was injured. Iraq Burin is a village with 700 inhabitants outside of Nablus, in the Westbank. 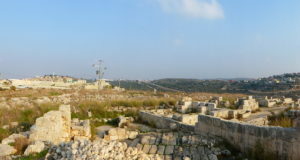 The village is surrounded by the two illegal settlements of Bracha and Yizhar and their outposts. The settlers have so far stolen 4000 dunams of land from the village. On the 27th of January, 20 year old Oday Qadous was shot and killed by settlers while gathering wood between the villages of Iraq Burin and Burin. About one year ago the villagers of Iraq Burin held a weekly demonstration against the theft of land by the settlers. 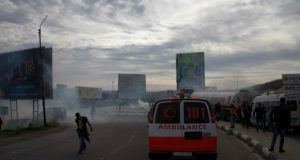 The Israeli military answered the protests with great violence, fireing tear gas and rubber coated steel bullits directly at people. In march 2010 Mohammed Qadous 16, and Asaud Qadous, 19, were killed by Israeli forces during a non-violent demonstration in Iraq Burin. After the tragic incident the recidents of Iraq Burin made the decision to stop having the weekly demonstrations, as the price was just too high.